As my series of posts about our holiday in Spain begins to draw to a close here's a post about Seville, brought to you by the online travel agency, Destinia.com. Sadly a place we didn't get to on our visit but somewhere I'd like to visit at some stage. Seville is located in the Southern region of Andalucia in Spain and is considered to be one of the most traditional ones in the country. Known for the Feria de Abril, a large fair that takes place after Holy Week, this city is filled with ancient churches, historical cathedrals and tiled plazas. The city is pedestrianized and many of the main cultural landmarks are nearby, making it a prime location for those who want to explore this historical city. The Feria de Abril is the city's main event, celebrating the culture of flamenco. Many marquee tents called casetas are set up, with some of them being private, invitation only tents and others being public. Flamenco dancers, guitar players and singers flock to the city to join the festivities, and many locals dress in the traditional colourful flamenco dresses. 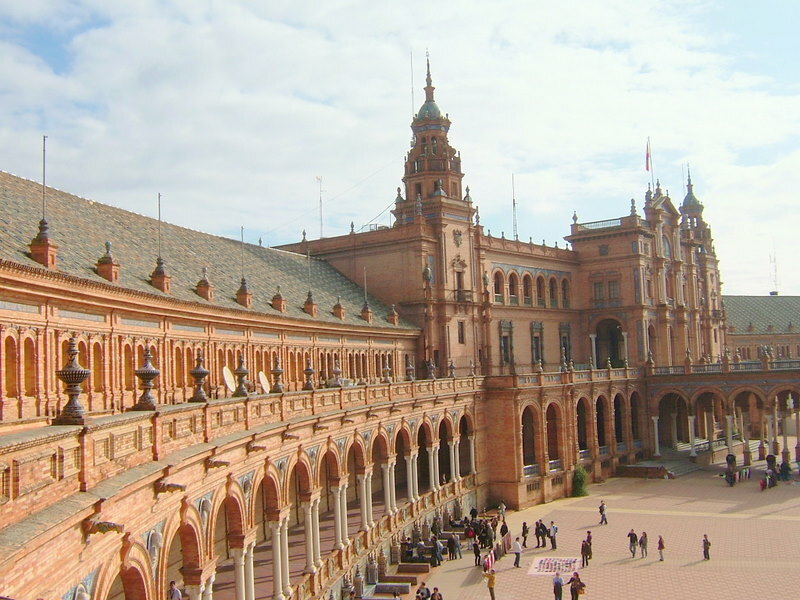 Seville could be considered a traditional Spanish city. The influence of Christians, Jews and Moors can be seen in the architecture, and tiled plazas with fountains decorate the city's streets. The ancient Real Alcazar of Seville is a palace built in Mudéjar style, and tours can take visitors to its many rooms and tiled courtyards. The Cathedral is one of the city's main monuments and the resting place of Christopher Columbus. Built on the ruins of an ancient mosque, this cathedral and the square are lit up in the afternoons. The Giralda is a minaret tower that was converted into the bell tower of the cathedral from where visitors can enjoy views towards the city. The Archive of the Indies is an ancient Renaissance palace that was used by traders and was later reformed into the archive which held historical documents. María Luisa Park is one of the city's main parks. The Guadalquivir river flows through the park, where visitors can rent boats. The Plaza de España is a large central square located in the park. The square is known for its 58 recesses, each representing a province and decorated with tiles that characterize the province. Visitors will be able to enjoy many tours around the historic city centre, considered to be one of the largest one in the region. There are many tours by foot and on bikes, and visitors will be able to enjoy traditional tours in a horse pulled carriage. Many boat trips across the river start from the Torre del Oro. This tower is a dodecagonal watchtower which used to be part of the city's fortifications. There are many activities in and near the city, including side trips to nearby water parks and the Doñana National Park. Isla Mágica is a large theme park where visitors can enjoy fair rides, roller coasters and water rides. Seville is a city of art. The Museum of Fine Arts is known for local art masterpieces and for its fresco painted ceiling that dates from when the building was a monastery. Hospital de los Venerables, located near the historic Plaza de Toros de la Maestranza bullring, is a baroque building that has a large collection of paintings. Tapas are part of the city. The districts of El Arenal and La Macarena are filled with chic and traditional bars. Visitors can join the locals and explore the many bars where they can taste typical tapas, mainly the tortilla de patatas omelette, the jamón ibérico ham and pieces of bread with salads and anchovies.